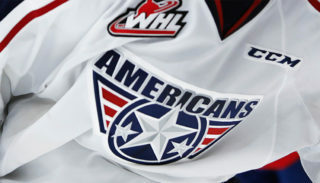 After an eventful shootout victory over the Thunderbirds last night in Tri-City, the Americans traveled to Spokane today to take on the Chiefs. The game extended into another shootout ending in a 2-1 victory for the Americans. Beck Warm leads the league in shootout victories with a perfect 6-0 record. The game remained scoreless through the first two periods. Aaron Hyman received a five-minute major penalty for boarding and game misconduct at 8:10 second period leaving the Americans short a defenseman. Tri-City was out shot 30-15 heading into the final frame. 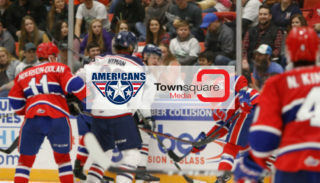 The Americans were a perfect 6/6 against Spokane’s top-rated power play including a five minute penalty kill on Hyman’s boarding penalty. Jaret Anderson-Dolan scored the game’s first goal at 5:04 third period. Parker AuCoin responded for Tri-City three minutes later on the power play to tie the game. AuCoin’s goal extends his streak to five games (5 goals, 3 assists). Regulation time expired with the game tied 1-1. 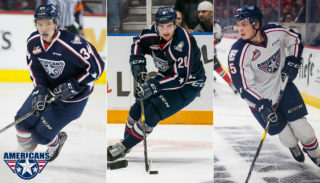 Spokane out shot Tri-City 4-2 in overtime but were unable to get past Beck Warm. 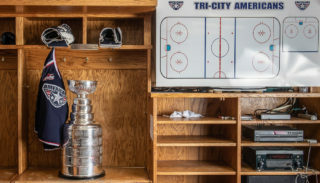 The game continued into a shootout where 2019 NHL Draft Prospect Sasha Mutala was able to seal the victory for Tri-City.